Tea was introduced to Russia in the mid-1600s when the Chinese ambassador to Moscow of the time made a gift of tea to Tsar Aleksey Mikhaylovich. Russia was trying to establish trade with China and tea soon became popular. In 1558, Tsar Ivan IV provided the Stroganov merchant family possession of Siberia. However, the only clause was that the family had to occupy a vast region. The Cossacks, who acted as protection for the tsars, started establishing communities. When Russian explorer Deshnev reached the Pacific coast in 1645, Russia and China had a boarder dispute. Thus, the Treaty of Nerchinsk was drafted and signed in 1689, allowing a common boundary line between China and Russia and allowing trade caravans to pass peacefully. The trade route was difficult, since the road was over mountainous terrain and the journey took over 16 months. Thus, tea prices were very high and was a luxury only afforded to royalty and the very wealthy. In the 1700s, tea prices went down a little, allowing laymen to start drinking the amazing beverage. The trade caravans ceased to exist when the Trans-Siberian Railroad was completed in the 1900s. Now, tea and vodka are the two primary beverages in Russia. Russians took to tea because it was warm and hearty, preferring stronger, darker brews that are sweetened with sugar, jam or honey. A samovar and podstakanniki were both beautiful and functional. 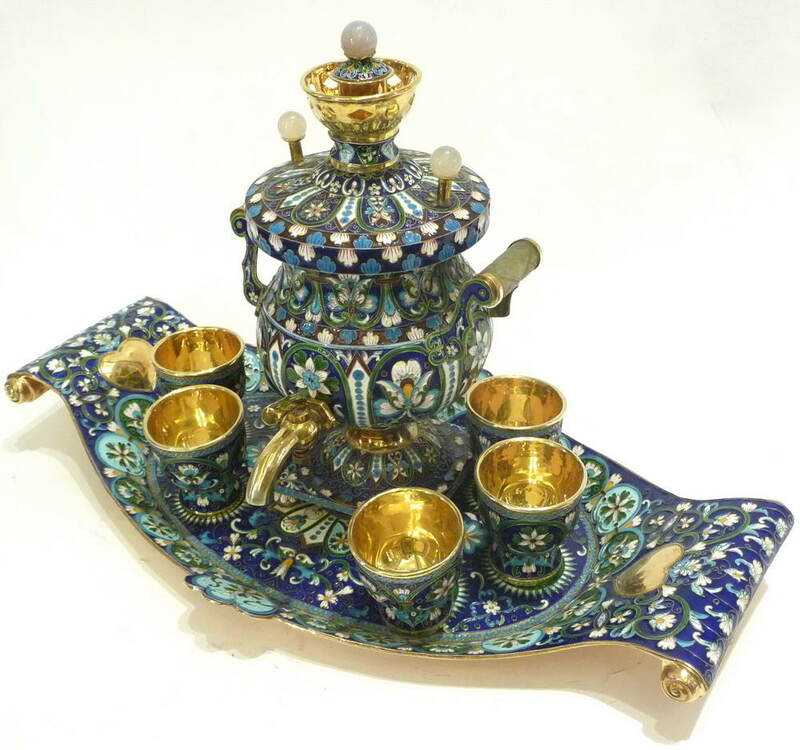 Intricate samovars, an adaptation of the Tibetan hot pot, was both a heater and a source to boil water. Tea is sipped from podstakanniki (under the glass): silver holders which hold the hot tea glass. Russian tea is typically comprised of two or three types and flavors, brewed dark and in separate pots. When mixed in the cup, additional water is added to dilute the stronger brew. The teapots are designed to sit onto of one another with the bottom pot holding the hot water. The next pit will be for very dark tea. Finally, the highest pot holds herbal or mint-flavored tea. This saves space and allows the tea to stay hot longer. The samovar has become a focal point in the Russian household, acting as both a functional item and a beautiful centerpiece for social gatherings. It would be used as a sort of bragging right, allowing guests to admire the ornate one. Women serve the tea to family and guests. It is served at all meals and pretty much and time of the day. Sometimes, you can find street vendors with samovars marketing cups of hot tea to tourists. Kilu.de. 2011. samovar_P1070701_big.JPEG, 26 Jan 2012. JPEG. DeLaine, Linda. “Tea Time in Russia.” Russian Life, 2012. 26 Jan 2012. Web.